New details on the demo included with Final Fantasy Type-0 HD. Famitsu this week has new details on the Final Fantasy XV: Episode Duscae demo included with early copies of Final Fantasy Type-0 HD. In addition to plains, the Duscae area (the region playable in the demo) has mountainous areas overflowing with trees. If you search every nook and corner, you’ll also discover caves. There is a likely possibility that there will be hidden treasures, but also likely that there are strong monsters living near them. During battle, you’ll accrue experience points required for leveling up. But none of it will actually get ‘digested’ until you camp and it is all tallied towards your characters. While camping, there will be events in which you talk with your comrades, you can adjust your equipment, and Ignis can make food, which you can eat. Eating strengthens your status. Players will also have a “Cooking Level.” In the screenshots, it shows players can use “Gighee ham” and “Aepyornis eggs” to make “Fuwatoro Eggs on Toast.” In addition to purchasing ingredients in town, you can also gather them by defeating monsters. 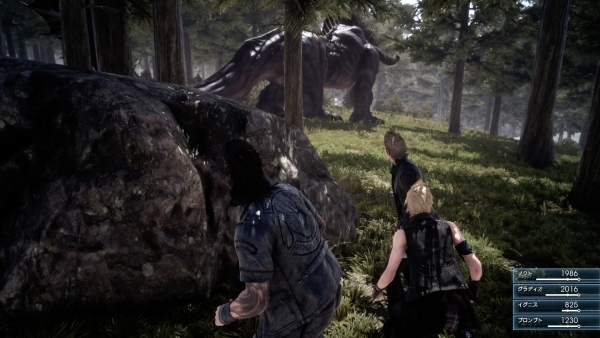 Players can also battle the Behemoth from the trailer in the demo. You should prepare quite a bit in advance, however. If you challenge it on a whim, you’ll likely be wiped out if it catches you even a little off guard. Luckily, in this game, your comrades can save you from the verge of death, even if your HP hits zero. Square Enix will give us a full walkthrough of the Final Fantasy XV demo via the latest Active Time Report live stream this Friday, February 20.